I have looked at and used other Outlook sharing programs, but I have to say that yours has been the simplest and better than others. What I really like is the ability to share folders with anyone with Outlook, not just people on your local network. Pricing seems to be fair considering how powerful and user-friendly the program is. Some will tell, you can get the same for free. I say - cheaper, not always better. I can relay on Plug2Sync and Backup. I trust this program. It did everything i needed to be done - full synchronization of my PC: files, folders, favorites(!) and most important - Outlook! I've got all technical support from 4team,all step by step instructions.Truly, helpful program for all of us. The moment I found Plug2 Sync and Backup was the liberation form all my problems. I love the way my PC has all folders, favorites,bookmarks et ctr. And i always had troubles to put all things in the same order on the new place. With this soft i did it! Automatically saves and backs up word, excel files, other folders as well as Outlook information in USB drive. This is exactly what I needed! I no longer have to resend items via Outlook or upload work files to access them at home. This tool saved me a lot of time. I strongly recommend it to anyone who wants to work productively and hates spending time on thinking how office information could be accessed when sitting at home. Now I have to remember only to stick my USB drive to a computer. Plug2Sync and Backup does the rest of the job. 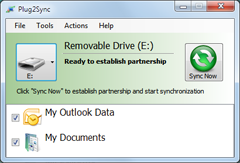 I was looking for a tool to sync my documents and other folders between 2 PCs. This tool made my life much much easier. The program syncs my data instantly!